A fellow local blogger has scored a couple of recipes from her experience at Z Kitchen: heirloom tomato salad with sottocenere al tartufo panino and sunchoke and chorizo puree. I cannot wait to try the panino in particular! Can't beat melted truffle cheese, fresh tomatoes and bread! Thanks, Prospero's Kitchen, for sharing! I fixed spaghetti and meat sauce and garlic bread for dinner over the weekend. I was in need of comfort food. I made a yummy meat sauce that is very easy. You could use 1/2 lb of ground veal and 1/2 lb of ground sirloin or maybe pork or a combination of the three. It might be good with some dried basil in the sauce too. Brown meats in a large skillet. Add garlic, onion, carrot to skillet. If there is not enough fat to cook the veggies, add a bit of olive oil. Cook until the veggies are softened. Add wine to deglaze pan and cook until alcohol burns off (a few minutes). Add tomatoes. Add 1 c. stock. Cook for 15 minutes and add more stock if it needed. Remove from heat. Add parsley and season to taste. Serve over pasta and with Parmesan cheese. I am too depressed about Tibet to eat or cook. It is the worst uprising since 1959. The Chinese govt will make Tibet pay dearly. Hopefully I will get my cooking/eating mojo back this weekend. I am planning to try recipes for cinnamon rolls, Sichuan fish, and pasta w/ meat sauce if I can get motivated. Mid-morning a Chinese woman called to say we had to leave Tibet and she asked us where we wanted to go. I didn't want to answer so I told her I'd call back when I had decided what to do. Well, by that point all phone services in our hotel had been cut off. My internet connection was also cut off. I found one working phone at the hotel reception desk so I called my cousin in Beijing. He gave me good advice and agreed to call my family to let them know I was safe. Around lunch time a woman came up to our rooms and said we had to be at a meeting in the lobby in 5 minutes and to bring all of our luggage. There were 7 Americans and Canadians and 3 Lithuanians they were trying to get out of our hotel to go to the airport. Since the roads were blocked, we had to carry our luggage a few blocks to go meet the vehicles that were going to take us to the airport. We saw that most of the shops were closed. People, all Chinese, were hanging around on the streets talking and smoking. 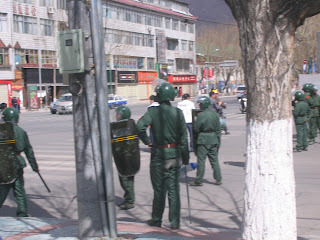 It didn't seem particularly tense, but we were in a Chinese area with few if any Tibetans. We could also see lines of military police in riot gear guarding the streets. We saw the military personnel carriers too. I took some pictures. Even though we were not in any immediate danger, the whole experience was traumatic! Being in a place while martial law is imposed is not fun. Plus I am deeply worried for the future of Tibet and broken-hearted that people will suffer. It is disappointing that I didn't get to see the places I've dreamt of seeing for years. Finally, I am still in need of a vacation!! I'm glad to be home, but I intend to go back to Tibet one day. So, I am back in Durham after a harrowing experience of being forced to leave Tibet. I'm tired, unhappy and jet-lagged. As soon as I recover, I'll write about what happened. Let's just say that a very bad breakfast of gelatinous rice porridge (aka congee), hard boiled egg, hard white bread slices, and hot tang foreshadowed a VERY BAD DAY. Quite shockingly, my work buddy and I have made it to Tibet. Given the fact that Lhasa is in the middle of an uprising, I figured our flights would be cancelled. Train service into Lhasa has stopped apparently. What we have seen so far is beautiful. We are surrounded by mountains. We were going to be in Lhasa for three days but I plan to change that itinerary tomorrow. If we can see the Potala and Norbulingka tomorrow then I'm hoping to get out of Lhasa ASAP. I don't feel worried about my safety particularly. There are really two issues: 1. The other cool sites like the monasteries and the main temple the Jokhang are closed. The entire Tibetan quarter and its shops and hotels (where we were going to stay) and restaurants are closed. 2. We are going to be closely watched and kept in the Chinese district. We've done Chinese all week in Beijing with work and going out at night. It's been fun but I am ready to experience a new culture. The few Tibetans we've seen so far are monks and nuns dressed in red and yellow or women dressed in traditional Tibetan wool skirts and jackets. The architecture is very different and so is the food. Unfortunately all of the interesting non-Chinese food is in the Barkhor, the Tibetan neighborhood closed because of riots. Besides Tibetan food, the offerings include Nepali, Indian, and Muslim Tibetan. I was looking forward to trying these. Instead we ate Sichuan food. It was excellent. Early in the trip we started ordering several plates and sharing them. This is how the Chinese eat meals together. I like it because I get to try many things. Tonight I was too hungry so I ordered a dish of sliced mushrooms fried in garlic, chili pepper and what looked suspiciously like fat back. It was spicy with a smokey, woody taste. My colleague ordered beef that had been dredged in flour and fried w/ red peppers and other spices that I could not quite identify. The peppers were fried until they were completely crisp. The dish had a spicy lemon flavor that I think might have been lemongrass. I'm glad to be on vacation finally. Work in Beijing went better than I had expected but it's so tiring to get up early in order to sit in traffic for an hour! I'm not a morning girl. Tomorrow breakfast is at 9AM! While I am sad about not being able to see much of Lhasa including the great monasteries, I am always one to support the underdog. I am not a fan of authoritarian regimes that control information, send people to work camps without fair trials, and do not allow people the freedom to practice or not to practice religion as they choose. Beijing has great food. I haven't had a bad meal here! Two nights ago we had dinner at a place called LAN Club, a fairly new restaurant design by Philippe Starck. The atmosphere can only be described as upscale tongue-in-check whimsical. A huge print of a Dutch old master (I think Dutch) has been cut into pieces, put into large , oversized gilted frames and hung on the ceiling over the grey, industrial vents and ducts. The light fixtures are various and asundry mismatched Venetian glass. The food was good but not great. This is the kind of place to go to watch people and to be seen and maybe to drink a cocktail or three. Nevertheless we ate dinner there. We had some good dumplings and some spicy shrimp marinated in tea. The big mistake was to order a cold dish of wasabi spinach. I love both, but I didn't quite bargain for the mountains of wasabi the chef must've put in this dish. It was hot enough to make my eyebrows stand up straight. It was hot enough to clear out every last nook or cranny of sinus. I could feel it right up my ear, through the Eustatian tube and into my brains! Two bites and I was done. A shame really. It tasted good. Last night we went to a Japanese restaurant called Hatsune that has a reputation for being the best in town. We had delicious sashimi, sushi rolls, tempura, grilled beef, and chicken. The beer was excellent and so was the sake. I have enjoyed my stay in Beijing. Work has gone great. I got some sightseeing in last weekend. And the food is truly outstanding. The pollution and traffic are horrific and unpleasant. Today the sky is blue, one day out of the six I've been here. The wind must've blown out the pollution last night. Years ago expats visiting Beijing remarked on the beauty of the blue skies. I can only imagine. The city is surrounded by mountains, and today we can see them. Many of the hills have beautiful old towers on them. Clear air is a basic human right. So is clean water. Speaking of human rights, tomorrow I am off to Tibet for a week of vacation. That should be interesting! We had a great lunch at a place specializing in food from the Guzhou province. I couldn't really tell you what the characteristic features are of this cuisine, but it is less oily than Beijing's native cuisine, not as spicy as Sichuan food, and not dim sum. I know that doesn't narrow it down too much, but that's the best I've got. We had rabbit, whole fish with fresh herbs, pork with finely chopped veggies, spicy beef, braised celery, steamed, crunchy green beans, cucumber and spinach soup, scrambled eggs, garlic stuffed squash with rice thread noodles, fried rice, rice cakes with radish, mashed corn that looked like tamales, and some thin, slightly caramelized rice cakes. Guess how one can scramble eggs with chopsticks? Put some clean smooth stones in a shallow, cast iron casserole. Heat until the dish and the stones are raging hot. Pour eggs over stones. Stir the eggs among the stones with the chopsticks. The stones simultaneously cook and scramble the eggs. It was fascinating though I don't think I will try this at home. I'm in Beijing for work this week. The jet lag is kind of rough the first few days, and I haven't felt hungry until dinner this evening. Nevertheless, the food is great. All of it. It's hard to have a bad meal here. Even weird food is good, although I've not eaten anything weird this time. The Chinese say that they will eat anything with four legs but the table. It is true. The menus are astonishing. I've been eating tasty dishes like fried eggplant in garlic, chili sauce and chicken with lemon, and Peking duck, and pan roasted green beans. I've eaten pork buns, shrimp dumplings with pumpkin, and mushroom soup with bok choy. The best cup of tea I've had in ages was lemon and lavender tea that turned a gorgeous shade of pale pink. I've had Chinese dishes and Halal dishes for breakfast. Now I'm on to museli because the others are too oily to eat at the crack of dawn. There are some downsides to China like the huge airport sign that said beware of cholera. Uhhh, yeah, don't drink the water or ice cubes or eat any fruit you didn't peel yourself, or use tap for brushing teeth etc. The air polution is nothing short of scandalous. The government also censors blogs. I can post, but I cannot actually read my own blog. Go figure! I bought some black, squid ink linguine at Target, of all places, several weeks ago. I found a recipe online and tried it last weekend. I was intrigued by this recipe because of the saffron. I love it and it works well with seafood, as I found out when I ate the delicious bouillabaise at Vin Rouge not too long ago. It's a delicate balance though. Too much saffron overpowers the subtlety of the scallops. Not enough saffron just makes the sauce yellow, so start conservatively and add a few threads until you get the taste you like. I usually crumble the saffron between my fingers when I add it to a sauce. The recipe turned out very well even though I substituted frozen peas for fresh snow peas which are not really in season yet. Be very generous with the butter in the sauce. I used a dry white Burgundy in the sauce. It was YUMMY. My beau was highly impressed (though, happily, he is not hard to please). The scallops should cook as little as possible because they very quickly turn into hockey pucks! Salt and white pepper to tasteBring a large pot of salted water to a boil. Add the linguine and cook until tender but still firm to the bite, about 10 minutes. Make the saffron sauce. In a heavy saucepan combine shallots and white wine. Reduce to 2 tablespoons and then add saffron threads and 1 to 2 tablespoons of cream. Place pan over high heat and whisk in butter a piece at a time, adding the next piece before the last one has completely melted, stirring constantly. Do not allow mixture to boil. Add fresh lemon juice and salt and white pepper to taste. Place scallops in a steamer over simmering water and steam for 2 to 3 minutes. Then add snow peas and steam 1 minute more. Transfer linguine to a plate, top with scallops and snow peas and top with sauce. 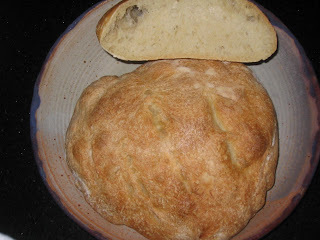 The February challenge for Daring Bakers, an online baking community, was Julia Child's recipe for French bread from vol. 2 of The Art of French Cooking. One reason I like the Daring Bakers community is that the monthly recipe challenge really does force me out of my 30 minutes or less cooking mindset. At this point in my life, I am too busy for long, slow cooking or baking except on special occasions or once a month when I get the recipe challenge. Ms. Childs' recipe for French bread has few ingredients: flour, water, salt, yeast. Deceptively simple. How hard could this be, I thought. Well technique is everything, and after reading Julia's 30 page description of the technique, I really wondered if I could pull it off. The dough had to rise three times, but even that didn't seem like a big deal. Well, twelve hours later the dough was finally ready. I suspect the dough would raise faster if it had been warmer in the house. A nice warm, low humidity day would be much better for this recipe. The hardest part of the recipe follows after shaping the dough: scoring the top of the shaped dough and then after the third raise transferring the dough to a baking sheet without deflating it. It sounds so easy! Uh no, apparently not easy. One loaf I deflated when I moved it. It is infuriating to have 12 hours of success only to screw it up at the last minute. I was not happy. The other loaf did not deflate but it didn't turn out so pretty because I kind of mangled the top when I tried to score it. The one successful loaf had the qualities you might expect in French bread, all obtained by the technique of course: hard crust, soft inside with big airy holes, nice salty bite. It was tasty but I think I'll buy my French bread half boule from La Ferme Bakery instead. Anyway, I am not going to share the 30 page recipe because it was not a tremendous success. If you are interested in the recipe, head to the library or bookstore for the book.